Horses are fun to look at, even more fun to ride. And turns out, fun to steal products from. Yes that says horse edition. Two of our cult favorites were initially make for horses, who woulda thunk it? 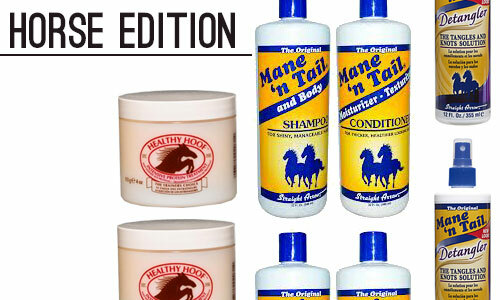 You are probably familiar with Mane N’ Tail shampoo and conditioner. I remember seeing pages dedicated to this product in spreads of my pre-teen mags and thinking “I Need That.” Unfortunately, L'Oreal Kids shampoo won over mom (boo). Years later, Mane N’ Tail is still a cult favorite for ladies looking to have locks as luscious as a horse’s mane - n’ tail too. Due to popular demand they have expanded from shampoo and conditioner into an entire line of styling products including detangler. Which I am using now since I didn’t get to indulge back in the 90’s. The second one is a MUST GRAB drugstore find when it’s in stock: Healthy Hoof. Technically this is for your cuticles (hoofs = nails) but I’ve found that it works amazingly well as a before bed cream for anything that is excruciatingly dry. Heels, hands, elbows - whatever.